Recurring episodes of severe pain along your face could mean you have trigeminal neuralgia (TN). Although not always curable, TN can be managed effectively with the right strategy. TN affects a specific pair of nerves called the trigeminal that signal pain in the face or jaws. They originate from the brain stem through the skull on either side of the face, with each nerve having upper, middle and lower branches. TN can affect one or more of these branches and cause anywhere from a mild twinge to excruciating pain. Causes for TN differ in individual patients. 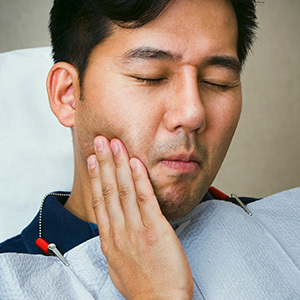 Though it could be linked to a tumor, lesion or cold sore, it most often seems to arise from a blood vessel impinging on the nerve and damaging its outer coating. This causes it to be hypersensitive: chewing, speaking or even lightly touching the face can set it off. The damaged nerve may also fail to "shut off" when the triggering stimulation stops. If you have these types of symptoms, your first step is to obtain an accurate diagnosis. You'll need a thorough examination to rule out other possibilities like jaw joint problems or a tooth abscess. Once we've determined it's definitely TN, we can then devise a treatment strategy. We usually begin with conservative measures like medication to block pain transmission to the brain or anticonvulsants that stabilize the nerve and decrease abnormal firing. If medication isn't enough, we may then consider an invasive procedure to control symptoms. Percutaneous treatment — often recommended for older patients or those in poor health — involves inserting a thin needle into the nerve to selectively damage certain fibers that will prevent the nerve from signaling pain. We might be able to move an impinging blood vessel aside from the nerve with a microsurgical procedure. As an alternative to surgery, high-dose radiation could also be aimed precisely at the pain site with a controlled beam to alter the nerve's ability to transmit pain. TN can be a source of great discomfort that lowers your quality of life. But employing treatment techniques that best suit your situation, we can greatly reduce the misery it inflicts.